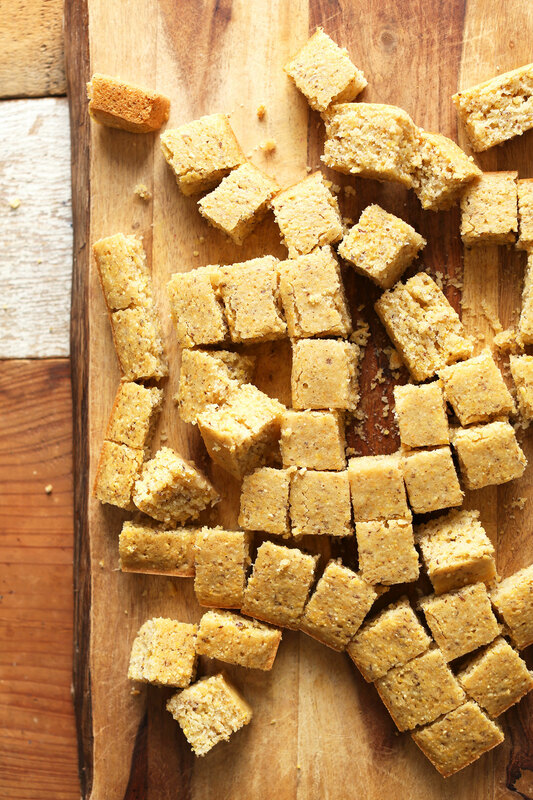 Easy-to-make, fluffy, perfectly sweet vegan cornbread made with 10 ingredients. The perfect comforting side to soups and chilis, or to bake into croutons for salads or stuffing. Preheat oven to 350 degrees F (176 C) and grease an 8x8-inch baking dish (adjust number/size of baking dish if altering batch size). To a large mixing bowl, add melted butter and sugar and whisk vigorously to combine. Then add applesauce, flax egg, and whisk once more. Next add almond milk mixture and whisk vigorously again to combine. Add batter to prepared dishes and bake for 28-37 minutes, or until the edges are golden brown and a toothpick inserted into a center comes out clean. Let rest in the cooking dish for a few minutes before serving. I highly recommend serving these with just a touch of non-dairy butter and maple syrup or honey if not vegan. Will keep in an airtight container for up to a couple days. Store in the freezer to keep longer. These would go excellent with my 1-Pot Red Lentil Chili. *Recipe heavily adapted/expanded from my Vegan Cornbread for 2. This is delicious! I had to make another batch because the first one disappeared before I could bring it to my meeting. The non vegans didn’t even know it was vegan. Everyone loved it. I subbed oat milk because that’s what I had and it was totally fine! Finally made this to put on top of the Super Thickness Three Bean Chili. I had 7 mini muffins from the left over batter and I Can’t stop eating them! This was delicious! I also cut the sugar, adding just 1/4 cup, which worked well for my purposes. I didn’t have any apple sauce, so I used olive oil instead. That worked fine. After I added the baking soda to the liquid ingredients, I understood the logic – it reacts with the vinegar and starts to bubble, probably helping the bread rise a little more during the baking. I was trying to recreate a non-vegan blueberry cornbread from a local restaurant, so I added about 1 cup of blueberries to the wet batter. Turned out amazing! I love this recipe! My vegan daughter showed it to me and I make it whenever I want cornbread. I use soymilk instead of almond because of an allergy. Just a note — it never says when to add the baking soda, so one time I forgot. Thank you! This is ahhh-mazing!! I used aquafaba for the “egg” as I didn’t have flax meal and it worked out perfectly. Honestly the best tasting cornbread I have ever had. Having it with the one pot red lentil chili tonight. Thanks for sharing all of these amazing recipes Dana. I’ve been following you and using many of your recipes for a few years now and am one of your biggest fans. I am purchasing one of your cookbooks NOW. I do better with a hard copy in front of me, I’m a little old school that way ;) xo. This is the best cornbread I’ve ever had. I made it for two different families this week and they couldn’t believe it’s vegan. It’s just SO good. Amazing. Seriously, so delicious. I might eat the whole pan before dinner. Every time we have legumes, my husband makes cornbread from his grandmother’s recipe – heavy on the eggs, butter and buttermilk. This is by far the best alternative I’ve tried. It bakes consistently and has an excellent flavor! We’re glad you’ve found an alternative that you’re pleased with! Anyone know if this can be made with Stevia or maple syrup substitution for the sugar? Made this recipe tonight tonight to pair with your 1 pot red lentil chilli. I made as muffins and they worked great. The only applesauce I had was an unsweetened raspberry apple sauce snack cup- so I used it. They are a little on the sweet side, but other wise a great texture and very easy to make. This recipe came out perfect!!! I don’t think I will ever make a different cornbread recipe after finding this. Also, tip for making these as individual cornbread muffins: spray down a muffin/cupcake tin with cooking oil spray and cook for only 16-18 minutes (I discovered this accidentally when I didn’t have a baking pan and the cornbread sides were just getting crispy on the edges at 18 minutes in the muffin tin) . The muffins popped right out with a simple nudge of a spoon and they are the perfect balance between solid and fluffy, mealy and just a little sweet. I have made this twice now and both times it has come out dense and doughy in the middle. The flavor was great but texture way off. I have cubed it and tried to bake the cubes but they just turn into doughy hockey pucks. It was fine because I used it for stuffing, but I wonder whether others have had this issue and what the solution might be? Is there a substitute for the flax egg? You have saved us!! This is the most excellent recipe! The whole stuffing recipe is perfect. Thanks SO much! I made this last night and it turned out quite good: light, moist, and a nice corn-y flavor. Since I was making this to use later this week for Thanksgiving dressing, I omitted the sugar. I also substituted olive oil for the vegan butter because I have to eliminate saturated fats from my diet (doctor’s orders), but otherwise everything else was as called for. Definitely will make again. This was delicious! I used soy milk instead of almond milk. I didn’t have applesauce, so I added 1 tablespoon of canola oil, as another reviewer had recommended. I cut the sugar down a bit, as here in the South we like our cornbread more on the savory side. It only took about 28 min to bake and was very tasty- will definitely make this again! The two of us nearly took down the whole batch (1x the recipe) so I might double it the next time I make this. Thanks for the great recipe! Hello! I’m allergic to almonds. Would this work with coconut milk? I imagine I’d have to tinker with it because of the higher fat content? Also allergic to cashews. Any other non-nut milks Incould make this with, or advice for coconut milk? So delicious! I made the recipe with coconut sugar (not cane sugar) and sunflower oil (not vegan butter) and it was perfect! This will definitely be in the regular rotation with soup/stews this fall and winter. Hello, would it be possible to substitute aquafaba for the flax egg? If so, how much do you think you would use? Hi! We haven’t tried aquafaba in this recipe, but its worth a shot! Another reader used 2T whisked aquafaba and had success! I love this recipe blog. All the recipes are excellent. For this recipe, I didn’t use the applesauce and I substituted the baking powder for 1 tbsp baking soda , I reduce the sugar to 1/4 cup, used coconut milk instead of almond. Perfect buttery cornbread muffins with the right amount of sweetness. Did not rise at all. Total disaster… Traditional cornbreads cook at 450º Why 350º here? Hi Jeff! Hmm.. It doesn’t get super puffy but does rise. Did you by chance leave our or use expired leavening agents? Hi – Can this be made ahead of time and frozen? Yes! Once baked, it can be frozen for up to 1 month. I made these last night and the flavor is great! However, the inside is very mushy. I cooked them for over 40 minutes and even raised the temperature (from 350 to 375) midway through when it didn’t look like they were baking. Are they supposed to be soft and almost uncooked in the middle, or should I have left them in longer? What’s the texture supposed to be like? I’m not sure if I’m just used to really dry cornbread and if it’s the contrast between these and what I’m used to that’s throwing me off or if I should’ve done something differently. hi there! could I use corn flour instead of all purpose flour? We haven’t tried and can’t say for sure, but I am not sure it would work since there’s no gluten in corn flour, so it would be very flat and dense. Amazing awesome delicious best cornbread in the world!!!! Okay so only just realising that the flax egg mixture is a separate one from the almond milk one. I combined them all together :( will this affect my baking? This is great! It has the perfect texture. The only thing I changed was the sugar. I only added half the sugar as I wanted a less sweet version. I doubled the recipe and baked in a 9 x 12 pan. Cooking time did not change. Thanks so much for being my go to for recipes! Great! Thanks for sharing your recipe changes, Karen! I omitted the Vegan butter and increased the applesauce to 1/2 cup. I also used parchment paper instead of oiling the pan. It was delicious. We don’t like sweetened cornbread so only used 1 teaspoon. We like this recipe very much and will make it again often. Obviously I meant a teaspoon of sugar is what I used. This cornbread is the only recipe that we use now. It is delicious. Thank you for caring and sharing. Good, but way too sweet. It’s like a dessert bread and even then it’s sweet. Hi Anne! Feel free to cut down the sugar in the future if you found it too sweet! This came out Amazing! It was super moist and sweet just like I like it. Definitely my new go to cornbread recipe. I did make some substitutions using what I had on hand: For the cornmeal I used Arrowheadmills Organic Blue cornmeal, I switched the amount of butter and apple sauce to make it a bit lower in fat. I was out of butter so I used 2 Tbsp grape seed oil and 1/3 c applesauce , and I baked it in a cast iron pan which I preheated with the oven. I used lemon juice to curdle freshly made almond milk. Otherwise I followed the instructions. YUM! Made this last night, and I felt like I just had to pop on here to leave a quick comment about how much I like it. This corn bread has just the right amount of sweetness & yummy texture to make it worth the effort of whipping it up. :) If you’re on the fence, I ~highly~ reccomend making it – I don’t think you’ll be disappointed! Thanks Dana! So good!! I didn’t have any applesauce so I left that out and I added 1 chopped jalapeño to the batter. Made it tonight and it went perfectly with our red beans over steamed broccoli – Delish!! I love this recipe! I made it twice during the holidays as a base for cornbread dressing and just made it tonight to go with chili. Made it EXACTLY as written and it was fantastic! Thanks, Dana! Happy New Year! Hi there! This recipe looks fantastic, but I try to avoid cooking/baking with butter and oils, so I’m wondering if it would be possible to substitute full-fat coconut milk instead? Thank you so much! Hi Amy! Not sure we haven’t tried it, if you give it a go, let us know how it turns out! This cornbread was the hit of my meal, even though I messed it up in several ways. It came out perfect and delicious! I used coconut sugar, all I had, and was a little short. Oops, I mixed in the cornmeal and flour before adding all the wet ingredients. Finally, I put it in the hot oven for 3 minutes before realizing I forgot the baking soda. I took it out and mixed in baking soda and it still cooked perfectly in 30 minutes! Maybe I’m lucky, or maybe this is my favorite fool-proof baking recipe ever! My son can’t have almond milk. Can I sub with coconut milk? It says prepare in ‘cooking dishes’, if I were to bake this in a flat iron skillet, what size do you recommend? Should I double the recipe for a 12 inch skillet? I would probably double for that size, yes! Applesauce usually does the trick for me! Amazing! soft, flavorful, moist. Only thing was a slight taste of baking soda, but still worth making and enjoying. Thank you for a super easy and impressive corn bread recipe! Went really good with a vegan stew we made today for family who are not necessarily plant-based, and got lots of compliments! Thanks for making food everyone always enjoys. Currently making my third batch. Yummiest cornbread EVER. You have outdone yourself Dana. A very awesome recipe…made it with about half the sugar (because I prefer less sweet, like many of the earlier remarks, noted here), but,stayed with the other recommended ingredients and quantities. Turned out just great! It has a little less “cornbread” color than some of the mixes I’ve used in the past, but that’s not necessarily a bad thing! Fabulous!! And thanks for egg substitute recipe. and I used coconut sugar which made the cornbread too dark. I did use chickpea flour (see other comment – ! ), and it works great! My inner child is doing the happy dance at this recipe. I have tried so many vegan cornbread recipes and they never turn out right. Too dry, too bland, too salty, not sweet enough… I’d almost given up. But I found locally ground cornmeal at my grocery store and figured I’d have another go and search for yet another recipe to try. I’ve avoided this one because we avoid flax due to allergies, but I figured I could try modifying it. I used an extra 1 Tbsp applesauce, 3 Tbsp unsweetened soy milk, and added 1 tsp baking powder. IT IS AMAZING! The texture is spot-on, the flavor is great, it browned on the edges… Ahh. I need to go eat more. Thank you, thank you, thank you! This was amazing!!! So much healthier and tastier than my other cornbread recipe. It came out perfectly moist and sweet – I subbed oil for the butter because that’s what I had, and I accidentally bought vanilla almondmilk. Other than that- I followed the recipe exactly. 28 minutes was perfect. It didn’t even need the butter or maple syrup – fabulous as-is. I can get rid of that other recipe, now :) Thank you, Dana!! Hi! Instead of the flax egg, can I use a regular medium egg? Also, instead of butter can I sub the same amount of olive oil? Thank you, I’m excited to make this! Hi Mia! That should work! If I decided to add a can of creamed corn to this recipe, should I reduce the amount of almond milk? Hi! I don’t think it would work, it would probably be too moist! Made this today, reducing the sugar to 1/3C and substituted 2T whisked aquafaba for the flax egg. Also used a mini-muffin tin that made about 18 of them. So light and absolutely delicious. Going to reduce the sugar even more and make them savory next time with some of our great NM green chili. Thanks for the most excellent recipe! Hi Kiki! You could try coconut oil! Made this for the first time tonight, paired with chili…. it turned out PERFECT!! It was moist and perfectly sweetened. This will be my go to recipe from now on!! Thank you! Excellent!! I love this cornbread with your chili. I have made it several times. It’s become a regular at our house. Hi Crystal! We haven’t tried it, but you should be able to! Great recipe, tasty and easy! Wonderful recipe. I tried this out with 1 vegetarian, 3 adult omnivores, and a super picky 3-year old. Everyone loved it. This is now my go to cornbread recipe. Thanks tons for making tasty treat that have simple ingredients and produce wonderful results. This is the best cornbread I have ever had, vegan or nonvegan. I’m from the south, so I grew up on cornbread. It’s moist, it’s perfectly sweet with a tender outside, and it’s simple. The only adjustment I might make next time would be to add some mashed sweet corn. I might also cut the sugar a bit when I make it for chili, but those are just items of preference. 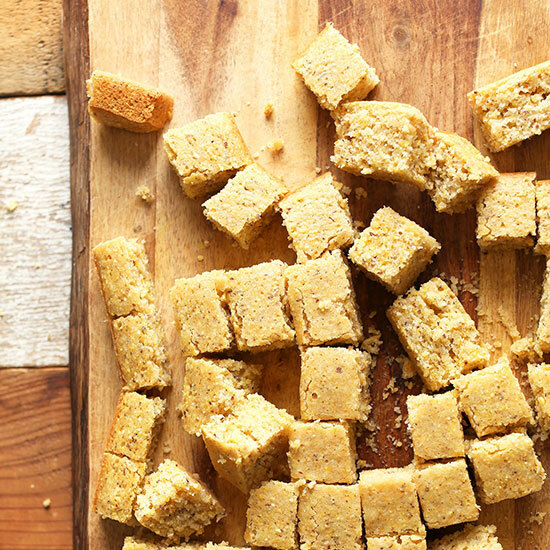 This cornbread is beyond lovely. Thank you for the recipe. This was soooo good! I’ve made vegan cornbread before and it turns out really bland, but this was sweet and savory and really delicious! I made it with vegan chili and the paring was amazing and I also had some as a desert with some vegan butter and maple syrup. The latter is to die for! I thought the cornbread would be to sweet when I tried the batter, but it mellowed out when I baked it. The sweetness worked really well with the chili as well as by itself! Thanks so much! Made this exactly and it was PERFECT! Thanks for the recipe. I made this tonight and while the texture is awesome it is super sweet, almost like a cake. I’m keen to try again but with just half the amount of sugar or possibly less. Definitely recommend that people trying the recipe go with 1/4 or less of a cup. Delicious, delicious cornbread. My first time trying to make a vegan cornbread. I added a little cinnamon and pure vanilla extract made it taste like cake. My family loved it. Thanks again for the recipe. I am making this tonight along with my vegan chili for our vegan kiddos – your recipes are the best, and i really appreciate the wonderful, colorful, flavorful write-ups, descriptions, backdrop to the beautiful food. I’m used to adding cheddar cheese and sour cream to my “non-vegan” recipe, so very curious to see how this turns out. I’m sure it will be dreamy, along with all the other concoctions i’ve tried of yours. Slowly, my sweetie and i are getting healthier thanks to our babes, and your recipes. i’m wondering if creamed corn can be added – it actually doesn’t have cream :). I missed the wonderful description you usually provide on this recipe btw – but it’s the first, so no biggy. Peace. My grandson is allergic to peanuts and tree nuts…can I use coconut milk instaed of almond? How many eggs did you use? I want to make a pineapple version if this. You think I could just swap out the soy milk for pineapple juice? Hi Ricki! Its worth a try! I am not sure how that would turn out, but if you try it, let me know how it goes! So I swapped out the soymilk for a fresh puréed pineapple that I strained after pureering in vitamin….Same amount. Used in Philly Vegan chili contest along side my chili and won people choice!! Whoop whoop. Great recipe, as usual! Made this with a GF blend of 60 grams whole grain/stone ground Millet flour and 50 grams stone ground white rice flour. It came out soft and perfect! I also made it with your DIY Gluten Free Flour blend and was great as well. I used GF stone ground/whole grain cornmeal! Substitute sugar for coconut sugar, and once 50 gr. coconut sugar and 50 gr. Xylitol. I Didn’t have any issues with the baking time, both came out soft and with brow corners. 100% good and tasty. This is what I call a balance recipe! Can a real egg be substituted for the flax egg? I want to make this today but don’t have any flaxseed meal! So good! No applesauce- subbed one TBS veg oil. I also used coconut oil instead of vegan butter. Another great recipe ! Thank you! Thanks. That really helps me as we are also gluten free. Perfect! I’m planning to make them for a vegan babyshower and wanted to make muffins! So glad u did and it worked. Did you make day of or day before? I made them day of but they were still good the next day. Is there any other vegan fat I could use to substitute the vegan butter? Perhaps coconut oil? Going to try to make this tomorrow, but don’t have vegan butter! I don’t see why coconut oil wouldn’t work just fine. Could I use gluten free all purpose flour? This is absolutely a fantastic recipe. Moist, light and flavorful – perfect to go with my black bean soup. My wife is a vegan and I’m always looking for recipes that I like, and are vegan. This rocks! Wow, I never really liked corn bread but thought I might pair it with my vegan chili and I was blown away at how good this is. I showed all my friends and family and they couldn’t believe it was vegan! Super impressed thank you so much. Question: Is there any way I can sub the butter for a healthier alternative? Just thought I could make it on a weekly basis haha! This was amazing! my non vegan family loved it! Have you ever found any whole food alternative to vegan butter for a recipe such as this? I made a double recipe of this today. It tastes great, but it didn’t fluff up in the oven at all. Is that normal? What did I do wrong? Hmm, that isn’t normal. It doesn’t get super puffy but does rise. Did you by chance leave our or use expired leavening agents? You know, the baking soda may have been a little long in the tooth now that you mention it. I guess I didn’t realize it could lose its efficacy like that. I forgot the baking powder too because the recipe description actually never calls for it and I didn’t double check that I had used all the listed ingredients. Hi Margaret, the baking soda is listed in step 2 of the instructions. Perhaps the confusion is that it is added at a different step than you may be familiar with? Hope that helps clear up the confusion! I just made a double batch of this today, and I plan to use it to make the vegan cornbread stuffing recipe. It’s delicious! Fluffy and moist, and a good balance of sweet and savory. The batter was a bit on the sweet side, but after baking, the sweetness mellowed out, and it’s wonderful. I’ll definitely make this again sometime, and use it as a side on its own. OMG So good! I used whole wheat flour because thats all I had and I am in love. I never really liked cornbread but this recipe changed my mind completely! Thanks! I made this a couple of days ago to use in a veganized version of my mother in law’s southern cornbread dressing for Thanksgiving today. I left out the sugar (southern cornbread doesn’t have it), and I used spelt and coconut flours instead of wheat flour because it also had to be GF for a family member. The batter was very thick, so I added a little extra unsweetened almond milk. The cornbread came out heavy, probably because of the flour substitution, and next time I’ll add baking powder. It was great in the dressing, though. Non-veg hubs said it tasted just like the full octane kind, and he’s happy with having just vegan dressing from now on. Don’t tell his mother, though :-) Thank you for another wonderful recipe! And……… I just saw that you HAVE a GF cornbread recipe! Next time! I also cut the sugar a bit as well, otherwise its too sweet for me. I only used 1/8 cup of sugar (instead of 1/2) and think it’s perfectly sweet; I also didn’t have applesauce so left that out. I can’t imagine how sweet this would be with the full 1/2 cup! I actually think a bit more salt might be nice. I also swapped in olive oil for the butter and added a bit of thyme and sage to make it more festive! Good call, I should have done that too. I made this last night and it was way too sweet for my tastes, but still good. I will make it again but go with 1/8 cup like you did. I just made one batch of this, and it is so delicious that I’m about to make another! I added in 1/2 tsp baking powder, and I sifted both leaveners into the dry ingredients instead of mixing the bicarb with the milk (because I’m too stubborn to follow a recipe I guess.) Anyway, so good! Sorry Jenny! Try refreshing your browser. Or, try using a different browser? It works fine on our end. What size pan should I use to bake the cornbread in? Thank you now I see it. I ended up using 9×9 but since I’m using it for stuffing I figure it really doesn’t matter. Loaf pans also work well with this recipe! Do you think follow your heart egg powder will work in place of the flax? I’ve never used that for baking but I know on the package it does say you can. Not sure but it’s worth a shot! Did you try it? How did it work? This cornbread is wonderful!!!! Thank you so much dana! I have made so many of your recipes and this one in particular is exceptionally yummy!!! Well done!!! Could I use chickpea flour to replace the AP flour? Hmm, not sure. But it’s worth a shot! Flax Eggs??? Do I just mix the flax seed meal with the water? Do I form it into egg shapes? Do I form it into egg shapes? I don’t know why I thought this was so hilarious.